This is the most anticipated post in my blogging history...janjajaran! 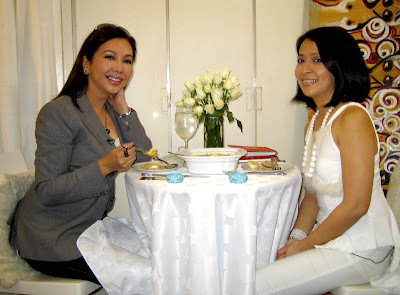 Korina Sanchez visited The Artist Chef condo! 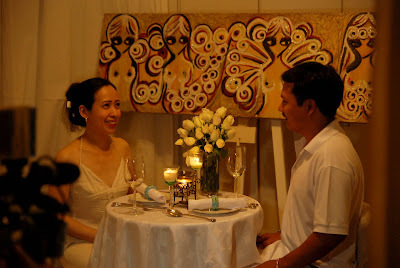 It was last February 28, 2008 when Korina along with her battalions of staff and crew invaded my little studio unit. There were unreasonable demands from her staff and numerous delays. It tested my patience and it consumed my two days of work. But I must say everything was all worth it! She's Korina Sanchez anyway. I can now proudly say that a prominent TV personality has already interviewed me. She also went to my place to eat what I prepared. She was supposed to taste the Paella Albino that I cooked but she ended up eating the Paella for the second round. She liked it. At least that's what she told me. She also appreciated my painting. She stared at the breast of the women for several seconds. She also asked if I have a menu, but I sadly told her that I don't have a printed one. I just gave her my calling cards instead. Beside me is Ana Lao, Advertising make-up artist. The woman behind the beautiful make-up I'm wearing. We constantly work together during photo shoots for print ads even way back to my DDB days when I used to handle SMART Telecoms. I was surprised to found out that Ana's first project was my print ad for SMART with Greg Turvey as my talent. Actually we were both surprised to find that out. This is my eldest sister Joyce and her husband Dan as extras for the segment story. Reggie bought the petals I used during the taping. He also took the behind the scenes photos. Thank you to all the people who stood by my side during the two days shoot. Thanks Julette for visiting my blog once more!